Coaster Photo – Rich Crompton Sr. and his son, Rich Jr., operate Rich’s Auto Body in Asbury Park established in 1982. When you call Rich’s Auto Body in Asbury Park to check on a claim or an insurance estimate, chances are Rich Crompton himself will take the call. But these days, it most likely will be Rich Crompton Jr. on the phone. The second generation of the family is assuming a more active role in the business, founded in 1982 and still repairing cars at 1602 Asbury Ave. Rich Sr. explains that the address may be Asbury Park, but a portion of the property lies in Neptune Township. “I pay taxes in both towns,” he says. Starting as a small body and fender repair shop in rented space, Rich Sr. bought the property from the owner’s widow in 1985. 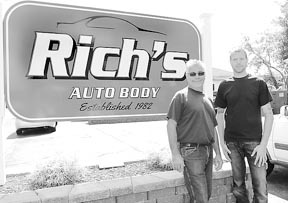 A lot has changed in the way cars are made and repaired, but the way Rich’s Auto Body does business is still the personal contact and word of mouth that keeps business coming. They deal with all insurance companies, offer 24-hour towing and provide a written Lifetime Warranty on their work. They are a Premier Car Care Shop of New Jersey Manufacturer’s Insurance and an AAA Approved Auto Body Shop. Repairing a car involved in an accident is more challenging today, with more sophisticated electronics as well as a different type of steel used by the manufacturers. New safety features also require more knowledge and education. “Cars are lighter and more aluminum is being used,” according to Rich Crompton Sr.
That requires a special room separate from the main shop and special tools as well. Even the paint used is different. It’s a more water-based paint but the man in charge of the paint shop at Rich’s Auto Body, Blake Fornarotto, has a been on the job for 30 years. The auto body shop has a staff of six working in the shop, including Office Assistant Nanci Smith. Rich’s Auto Body is an active member of the Asbury Park Chamber of Commerce and has also been a longtime crusader against the insurance industry’s efforts to steer business to their preferred shops, a practice known as the Direct Repair Program, or DRP. Learn more about that and Rich’s Auto Body at www.Richsautobody.com.